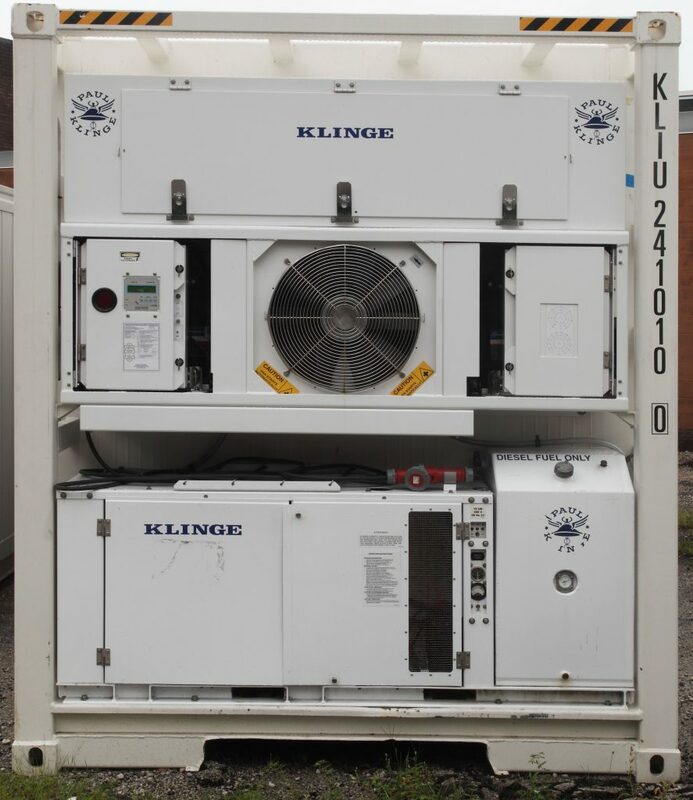 Klinge Corp’s Deep Freezer Unit, Model NMF-371, maintains cargo from 0ºC to -65ºC (32ºF to -85ºF). The freezer unit is available with an integral generator set for independent operation. Unlike other freezer designs, the NMF-371 Deep Freezer Container prevents defrost heat from entering the cargo area. More standard ultra-low temperature designs allow defrost heat to enter the container thereby heating up the cargo and at the same time reducing defrost efficiency. Klinge Corp’s unique design avoids these issues. The NMF-371 is also equipped with a hot-gas defrosting system, which is fast and efficient – even at ultra-low temperature ranges. Contact a Klinge Group Specialist Today! What Happens When Defrost Heat Enters the Cargo Area? When you are shipping seafood with transport containers, there is always a danger of defrost heat finding its way into the cargo area. Periodic defrosting is necessary for frozen fish transport containers and other refrigerated containers to eliminate the frost on the evaporator so it can function optimally. If it’s not properly designed, however, these containers can allow that heat to raise the temperature of your valuable cargo. While it is true that defrost heat that reaches your cargo when transporting seafood containers may only be a matter of a few degrees, this can make a tremendous difference when your cargo is fish or other seafood. For instance, frozen whitefish remains in high-grade condition for up to eight months if you store it at -20° F, but storing it at 15° F — still well below freezing — gives you only a month of highest-quality storage. Naturally, the threat of spoilage is the biggest issue of concern for your business when you are shipping frozen fish and other seafood. Spoiled seafood is either lost product or, even worse, product that could end up endangering the health of your customers. Often, there is no obvious way to tell if seafood has been warmed up to an unsafe degree in transit. For this reason, avoiding defrost heat leakage is crucial. Fortunately, with the Klinge Corp. Deep Freezer Unit, this is not a concern. We specifically designed this unit to quickly and fully defrost with a hot-gas system that does the job without allowing excess heat to affect your cargo. » HIGH CAPACITY: The NMF-371 is designed to maintain frozen cargo between 32°F to -85°F (0°C to -65°C). The freezer unit is equipped with three compressors: two for the high-temperature system operating on R134a, and one for the low-temperature system operating on R23. The high-temperature system cools the condenser for the low-temperature system. » EFFICIENT AIRFLOW: Evaporator fan motor and fan are designed to operate in constant ultra-low temperatures down to -65°C (-85°F). Standard motors will not hold up over time. » OPTIMAL DESIGN: Maximum cargo room and front access to major service components without sacrificing reliability and performance. Innovative evaporator design completes defrost in less time than competitors while also preventing heat from entering the cargo area. » BACKUP POWER: Optional integral generator set is capable of powering unit if loss of power occurs or during transport on truck. » BLAST FREEZER KIT: Unit is capable of acting as a Blast Freezer with increased capacity until -22°F (-30°C) circulated air temperature has been reached, at which time the unit returns to its initial function as a deep freezer. moist unconditioned air into the container due to pressure differences. This reduces the number of defrosts, minimizes defrost heat removal time, and maximizes product. Being able to effectively and safely transport your product is critical to any seafood business. The peace of mind from knowing you have highly efficient seafood transport containers, like those designed by Klinge Corp., is well worth the cost. If you have any questions at all about how these freezer units work to protect your cargo and your business, how to order deep freezer units, or any of our other refrigerated transportation solutions, please fill out our simple request for information form or call us at 717-840-4500.